Get Vendio Gallery - Now FREE! 2015 Bowman Inception Baseball Factory Sealed 8 Box HOBBY CASE-40 AUTOGRAPHS! The Product of the Year! We are Proud to offer this Original 2015 Bowman Inception Baseball Factory Sealed 8 Box HOBBY CASE!! This Factory Sealed HOBBY CASE includes 8 Factory Sealed Hobby boxes! Each Box includes FOUR(4) On-Card Autographs and ONE(1) Autograph Relic Card Per Box! That is FIVE(5) AUTOGRAPH Cards in Each Hobbby Box! Total of FORTY(40) AUTOGRAPHS in this 8 Box Factory Sealed CASE!! Look for SUPER HOT Kris Bryant and Jose Abreu ROOKIE AUTOGRAPHS!! 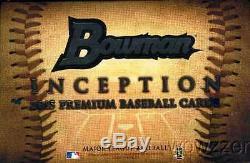 Bowman Inception Baseball is back for 2014, to follow up on its strong debut! With its epic design and elite checklist of prospects and rookies, Inception Baseball is one of the most anticipated baseball releases of the year. This year's edition will feature sharp new autograph sets such as the "Inceptioned" flagship Bowman design, Letter Nameplate Book Cards and SiriusXM All-Star Futures Game Patch cards. Inception Baseball is loaded with four on-card autographs and one autograph relic per box! PRODUCT DESCRIPTION PROSPECT AUTOGRAPHS Prospect Autographs: Signed On-Card Prospect Autographs will have the following parallels: - Gold Parallel: Sequentially numbered to 99 - Blue Parallel: Sequentially numbered to 75 - Pink Parallel: Sequentially numbered to 50 - Green Parallel: Sequentially numbered to 25 - Red Parallel: Sequentially numbered to 10 - Purple Parallel: Sequentially numbered to 5 - Inception Parallel: Sequentially numbered 1/1 - Printing Plates: Sequentially numbered 1/1 Prospect Inscription Autographs: Prospects include an inscription along with their signature. #'d to 10 ROOKIE AUTOGRAPHS Rookie Autographs: Signed ON-CARD Rookie Autographs will have the following parallels: - Gold Parallel: Sequentially numbered to 99 - Blue Parallel: Sequentially numbered to 75 - Pink Parallel: Sequentially numbered to 50 - Green Parallel: Sequentially numbered to 25 - Red Parallel: Sequentially numbered to 10 - Purple Parallel: Sequentially numbered to 5 - Inception Parallel: Sequentially numbered 1/1 - Printing Plates: Sequentially numbered 1/1 AUTOGRAPHS Silver Signings: Prospect and rookie subjects, featuring ON-CARD signatures in Silver Ink. #'d to 24 - Metallic Red Ink Parallel: Sequentially numbered to 5 NEW! - Gold Ink Parallel: Sequentially numbered 1/1 "Inceptioned" Bowman Autographs: On-Card Autos featuring the standard Auto design from 2014 Bowman Baseball, given the Inception-themed filter and style. #'d to 35 NEW! The Bowman Black Collection: Autographed cards signed with a silver pen. #'d to 25 AUTOGRAPHED RELICS Autographed Relics Autograph Relics and Patches: Prospects and Rookies, featuring an autographed sticker and a swatch or patch, will have the following parallels: - Pink Parallel (relic only): Sequentially numbered to 50 - Green Parallel (relic only): Sequentially numbered to 25 - Orange PATCH Parallel: Sequentially numbered to 15 - Red PATCH Parallel: Sequentially numbered to 10 - Gold Parallel (relic only): Sequentially numbered to 10 - Purple JUMBO PATCH Parallel: Sequentially numbered to 5 - Blue JUMBO Parallel (relic only): Sequentially numbered to 5 - Inception PATCH JUMBO Parallel: Sequentially numbered 1/1 - Silver JUMBO Parallel (relic only): Sequentially numbered 1/1 Dual Autograph Patch Card: Featuring sticker autographs and patches of two players. #'d to 15 - NEW! Triple Autograph Patch Card: Featuring sticker autographs and patches of three players. #'d to 5 Autographed MLB Silhouetted Batter Logo Patch: Rookies and Prospects featuring an MLB patch from the collar of a jersey and an autograph sticker. #'d 1/1 Autographed Letter Patch: Featuring full-sized letter patches and autographs of rookies and prospects. INSERTS 1989 "Bowman is Back" Silver Diamond Refractor: This insert is a continuity program in all Bowman products, celebrating the year that Bowman cards started to be produced again in 1989. UA All-America Contest Insert One collector will win a trip to the Under Armour All-America event in Chicago. Be Sure to check out our many other Items!! We stock a Huge Selection of Factory Sealed Boxes from every Sport! Plus the Largest Collection of Graded Cards in the World! Wait to pay until all items have been won OR 7 days after oldest item was won. (Please Note - we are not open on the Weekends and Holidays). Unless an item is damaged, it generally needs to be in the condition it was received, either undamaged or factory sealed, to be eligible for a return. Note on Factory Sealed Boxes and Cases and Graded Cards. On listings for a factory sealed box or case, any cards shown are images of manufacturers samples and are not guaranteed to be in any particular box or case. On Listing for Beckett BGS Graded Cards. We answer all emails within about 24 hours Monday through Friday. We are an Internet only company; we do not have a retail location. Get your own map of past buyers. The item "2015 Bowman Inception Baseball Factory Sealed 8 Box HOBBY CASE-40 AUTOGRAPHS" is in sale since Monday, January 18, 2016. This item is in the category "Sports Mem, Cards & Fan Shop\Cards\Baseball". The seller is "wowzzer" and is located in Santa Ana, California. This item can be shipped worldwide.